As incredible as it may sound, nature is still unbeatable and provides us with the most amazing inventions and phenomena, beyond human imagination. Bacteria that produce plastic or electricity, for example, or natural rocket propulsion or algae that may meet the energy needs of future generations with their supplies of hydrogen. How is it that frogs and fish fall from the sky, how does the dust from the Sahara reach the Caribbean and what lies behind the mysteries of the deep-sea methane oases? Yet nature has also invented modern technologies. A natural solar power plant, for example, provides an Antarctic lake with an agreeable water temperature, and the first functioning nuclear reactor existed in Africa two billion years ago. Nature even created the very first laser. Researchers around the globe are increasingly searching for ways of using nature's inventions for developing new products and concepts. One case in point are extremophile bacteria, which thrive at the baking temperature of 140 degrees Celsius. The resulting enzymes should prove fruitful in chemistry. But also chemosensors, which work like a dog's nose, and bulletproof jackets based on spiders' webs are visions that could profit from evolution's treasure trove. Following his studies in chemistry in Göttingen, Dr. Rolf Froböse worked as a scientists at the Max-Planck-Gesellschaft, was an editor at the technology magazine 'highTech' and editor-in-chief of the journals 'Chemische Industrie' and 'Europa Chemie'. Since 1995 he has been reporting as a freelance scientific and economic journalist on topics from the worlds of research and technology. 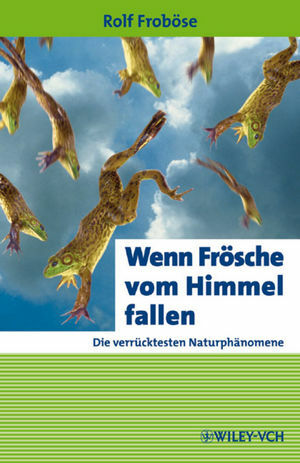 He has written several popular science books, including the Wiley-VCH "Lust und Liebe - alles nur Chemie? ".